It is difficult to remake a film that is already quite extraordinary. As A Man For All Seasons was a television movie and not theatrically released, I am not sure whether it technically counts as a remake to the 1966 film. In any case, this version of the Robert Bolt play sticks closer to its theatrical roots than the film adaptation, and is effectively directed by someone people rarely think of as a director: its lead, Charlton Heston. The 1988 television version of A Man For All Seasons should not suffer comparisons to the film, as both work in their own way and each is a expertly crafted production. The film is very open about being like the play right from the get-go, with Roy Kinnear playing "The Common Man", who addresses the audience directly. In keeping with the play, "The Common Man" is also seen as other characters (The Boatman, The Jury Foreman, and The Executioner). For the most part though, "The Common Man" takes the role of Matthew, the 'loyal' servant in the More household. 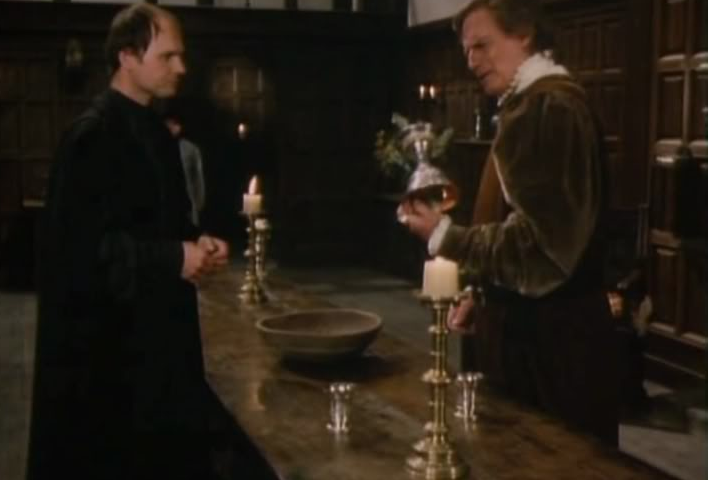 Sir Thomas More (Heston), a devout Catholic, does his best to stay within the law but out of the growing crisis of The Great Question: the potential divorce of King Henry VIII (Martin Chamberlain) and Catherine of Aragon. Catherine has been unable to produce a male heir, and Henry has his eyes on Mistress Anne Boleyn, but he cannot get a divorce from the Pope. Henry's Lord Chancellor, Cardinal Wolsey (Sir John Gielgud) wants to get it, but More doesn't see the logic of it all. After Wolsey's death, More becomes the new Lord Chancellor, but his problems only heap. His struggle between serving his Monarch and serving his King grow, and poor Lady Alice (Vanessa Redgrave) is no help. Neither is his future son-in-law Will Roper (John Hudson), who goes from Lutheran to Catholic, much to More's consternation. The conflict between More's faith and his duty is not helped by the machinations of Thomas Cromwell (Benjamin Whitrow), who wants More out. Aiding him is More's former protégé Richard Rich (Johnathan Hackett), who can find no help from More (who sees him unfit for a position at Court). They conspire to bring bribery charges against More, but when More's friend The Duke of Norfolk (Richard Johnson), not the brightest of men, shows them how More is not corrupt by any stretch of the imagination, they shall have to get at him another way. That other way is with a new Act of Parliament, which all loyal subjects must take. That oath declares the marriage of Henry and Anne legitimate as well as any children. More can live with that. HOWEVER, the Act of Supremacy also declares that Henry is the Head of the Church of England, and that More cannot swear to. However, since he never openly states his reason for not taking the oath, legally he cannot be charged with treason. This legal tangle ultimately entangles More, who is brought to trial for treason and is convicted thanks to evidence provided by now-Sir Richard Rich, Attorney General for Wales. More, knowing he is a dead man, finally speaks his mind, and loses his head. Heston as a director I think has not been given enough credit. Granted, he directed only three projects (A Man For All Seasons being the final one), but the telefilm shows that if he had chosen to, Heston could have developed into a most competent director. The film flows quite steadily, interrupted only for commercial breaks which are indicated by when the screen turns black). That aspect was out of Heston's control, but if you look at the performances (not counting Heston himself for the moment), we see that Heston could direct some of the other actors to give some of their best work. At the top of the list for great performances is Vanessa Redgrave. Now while it might appear downright bizarre to see the arch-conservative Heston and the equally arch-liberal Redgrave work together, the film itself shows not just that two people of wildly opposite social views can work together effectively (on-screen anyway), but that they did bring out the best in each other. Redgrave is wonderful as the sharp-tongued Lady Alice, fluttering and fierce. Their final scene together brings in that mix of haughtiness and deep love and rage and vulnerability that Lady Alice has for the man she loves but who exasperates her at times. If I am to be honest, I think Redgrave (the only actor in this version of A Man For All Seasons to appear in the original, albeit in a cameo role as Anne Boleyn), is actually better than Wendy Hiller, who I thought was always too 'classy' for the more undereducated Lady Alice. Though Hiller is wonderful in the part, I favor Redgrave's take. I also thought that Whitrow was excellent as Cromwell, making him coolly duplicitous, carefully plotting his way to get at More with a (mostly) controlled rage. Johnson (with whom Heston would work with again in the Sherlock Holmes television film The Crucifer of Blood) has great rapport with Heston as the friend who doesn't want any part of this. However, I think the best performance is Kinnear in his multiple roles. He brings humor to the show, and in one scene Matthew's profiting from his actual honesty to three different people is quite amusing. Hudson as Roper and Hackett as Rich were also good, though not great. They made on the whole a positive impression. However, just as there are good performances, there are bad ones. Chamberlain has ONE scene as Henry VIII, and I'll say this...he was quite energetic in his screaming at that one scene. Also, while in a play age or race is not a factor, Chamberlain's youth versus Heston's lack thereof here looks a bit odd (especially if you look at the film's version of making them contemporaries). Sadly, Adrienne Thomas' Meg is a virtual nonentity, coming across as flat and nowhere near the scholar she was. Finally, there is Charlton Heston himself. As was true in The Crucifer of Blood, Heston either couldn't or wouldn't bother to try for a British accent. As such, his distinctly American voice came through. Again, this can be somewhat forgiven in that Heston as a director (with Bolt again adapting his own play) made a very conscious decision to make A Man For All Seasons more theatrical. The opening firmly establishes that we are in a sense watching a filmed play. Therefore, a lack of accent after a time does not become a large issue. In the role, the moral courage of More does come through, and Heston delivers a solid, strong performance (though he will always stand in the shadow of Paul Scofield's version). There were a couple of other points that might have worked better. For example, while the scene at The Loyal Subject pub was strong between Whitrow and Hackett was good, perhaps Heston could have resisted the temptation to punctuate things with thunder. I also for the life of me don't understand why Charlton Heston opted not to include Sir Thomas More's final words of "I die the King's good servant, but God's first" at the execution scene. Minus that though, this version of A Man For All Seasons is a well-acted and directed film, one that sticks closer to the play. It is like watching a filmed play, but that is a complement in this case. It moves well, has some really good work, particularly out of Heston, Redgrave, Kinnear and Whitrow. It's a pity that Charlton Heston didn't direct more, but fortunately, just as Paul Scofield recreated his stage performance for the film, Heston did likewise, and we now have two good interpretations of this most noble man.